There's a reason Madonna was — and still is — the Queen of Pop: The legendary singer made a major impact on the world of music. But she also left her mark on the worlds of fashion and beauty, with many of her most popular looks becoming downright iconic. Perhaps the most recognizable? Her signature '80s curls, a style that took Madonna from up-and-coming to the star every teen girl wanted to be. Want to channel the wild, bold and voluminous look today? Just follow these steps. Wash and rinse hair using curl-enhancing shampoo and conditioner, then lightly towel it dry to remove excess moisture. Dispense mousse into the palm of your hand, then lather it slightly. Working from root to tip on one small section of hair at a time, generously apply product to damp strands until you cover your entire head. Gently comb through hair with a wide-tooth comb to help evenly distribute the mousse. Lightly spritz hair with a heat protecting spray, then begin drying, tousling hair with your fingers to give it extra body, volume and lift. Continue until hair is completely dry. After heating your curling iron according to the tool's instructions, split hair into a deep side part. Working with one small, 1- to 2-inch section of hair at a time, wrap your hair around the outside of the curling iron barrel from root to end. 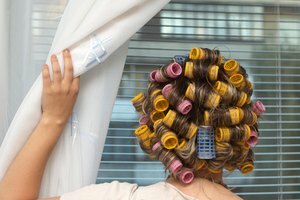 Hold hair in the wrapped position until it's warm, then unwind it, creating a tight curl. Repeat on each small section of hair until all strands are curled in the same direction. Using an additional handful of mousse, apply product evenly to curls, using your fingers to tousle your hair and add additional volume. Turn the hair dryer to its lowest setting and dry hair, continuing to tousle strands with your fingers. After drying, hair should have wavy, almost-crimped curls with some frizz and lots of volume. Spray hair generously with hairspray to ensure a long-lasting hold. To achieve Madonna's classic big-bow look, place a scarf or oversize ribbon at the base of your neck, grabbing one end of the scarf or ribbon in each hand and pulling them above your head. Tie the ribbon in a bow, then set with an additional spritz of hairspray.